Congratulations to Florida Department of Military Affairs employee Dawn Williams for achieving a 25 year employment milestone as an employee with the State of Florida. She currently works at the Florida National Guard headquarters in St. Augustine as the Assistant Purchasing Director. Her duties include purchasing for various programs throughout the organization, including supporting state active duty missions when the Florida National Guard is mobilized for these domestic operations. Williams started originally with the State of Florida, June 6, 1986, at The Florida School for the Deaf and Blind. Her mission at the Dept. of Military Affairs started December 9, 1990, with the State Quartermaster. 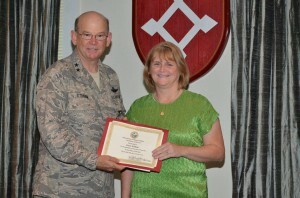 “It was an honor to have Maj. Gen. Titshaw present the award and recognize my service,” commented Williams. When asked what significant changes she has observed during these 25 years, Williams mentioned automation. The Dept. 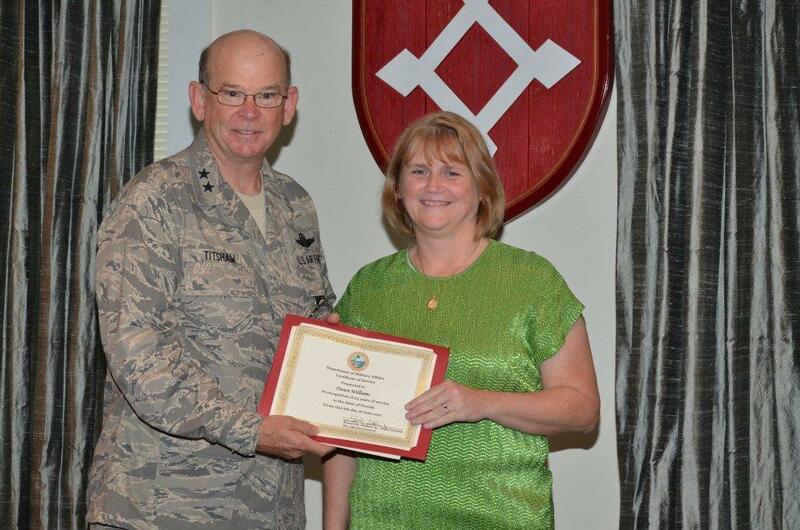 of Military Affairs and Florida National Guard appreciate the dedicated service of Dawn Williams.